Have you ever created a card and thought oh my goodness this is AMAZING?? I sure hope you have because all card are amazing and made with love. I will admit I don’t have that OMG feeling with all cards though. This feeling comes about once a year or sometimes longer. My last most amazing card was this one in November 2016! I still have that card and admire it randomly. Well today I’m sharing another one of my amazing cards! This one just screams beauty at me and I LOVE IT! I hope you love it as much as I do but if not that’s okay too! The colors, the pattern and that little hint of bling do it for me!!! I started with a Highland Heather card base and layered on a piece of Coastal Cabana measuring 4″ x 5-1/4″. Next, I took a piece of Whisper White (3-7/8″ x 5-1/8) and placed it in the Stamparatus. 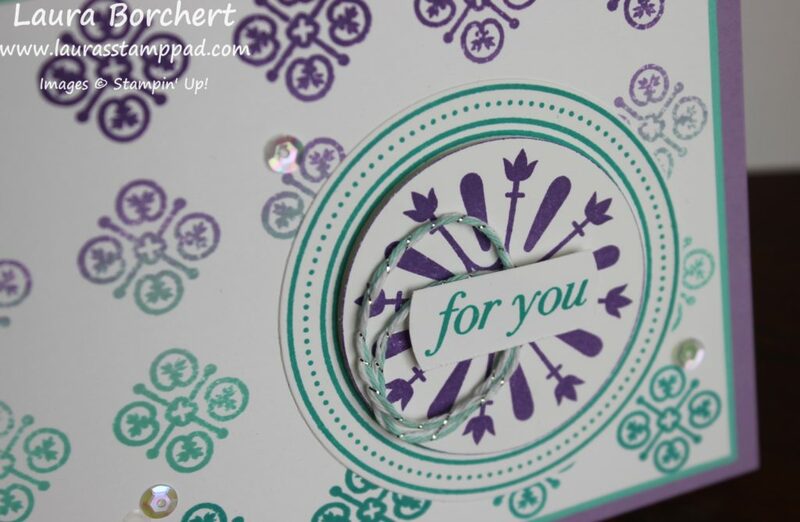 Using the Florentine Filigree Stamp Set and a Spectrum Pad, I created that amazing background! The colors for the Spectrum Pad are Gorgeous Grape, Highland Heather, Pool Party, Coastal Cabana, and Bermuda Bay. 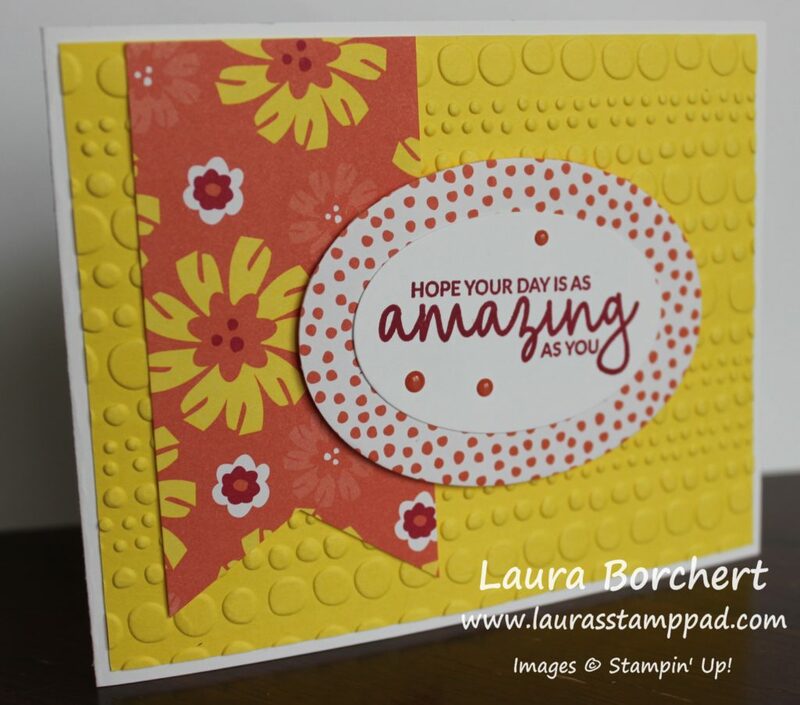 It is super easy to create because the Stamparatus does all of the work with spacing and stamping. Simply notch down the plate after each row. TIP: The hardest part is probably making sure the ink pad is always stamping the correct color on the same end. Place the ink pad above the Stamparatus Plate after inking each time with the flat side of the ink pad on the left side. Now for the focal point of those layered circles!!! 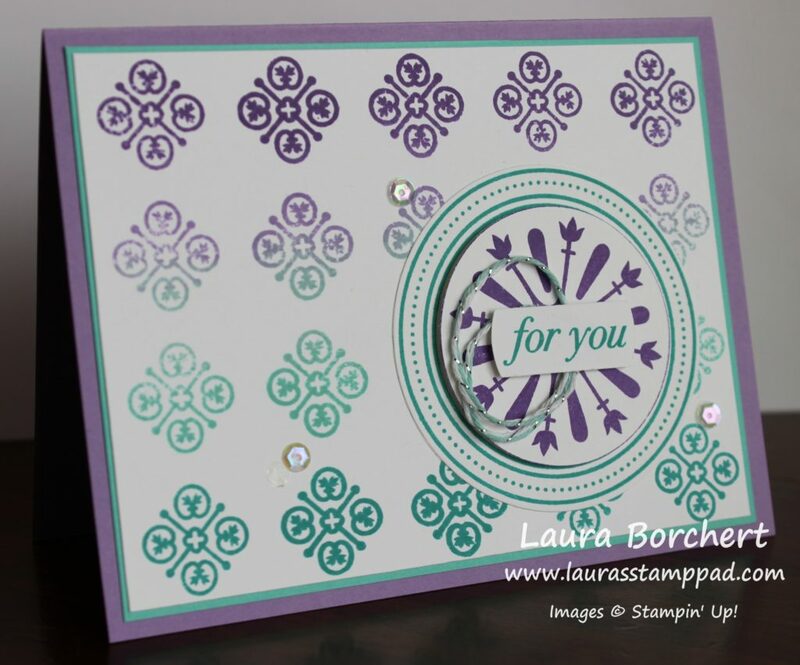 Using the same Florentine Filigree Stamp Set, I stamped the circle image in Bermuda Bay and in Gorgeous Grape. 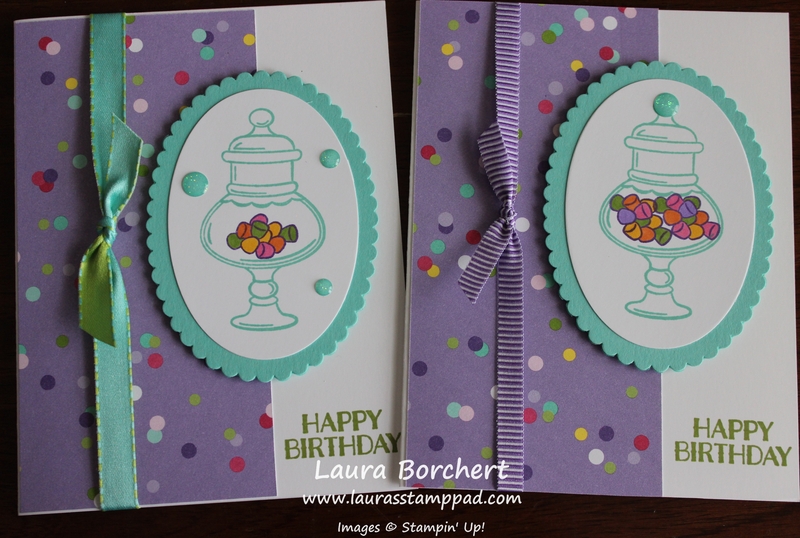 I used the Layering Circles Framelits for the Bermuda Bay Circle and the 2″ Circle Punch for the Gorgeous Grape one. Next, I stamped the greeting in Bermuda Bay and slide the long skinny piece of Whisper White into the 1-1/4″ Circle Punch. That is how I got those slightly rounded ends. Then I added some of the Pool Party and Silver Baker’s Twine to the back securing with Stampin’ Dimensionals for texture. I finished off the card with a few Gingham Gala Adhesive Backed Sequins for some bling! Isn’t it just fabulous??? What color combination would you use for your Spectrum Pad?? Let me know in the comments below because I have 2 left to ink up and I just can’t decide on the colors. I got the idea for this card from the fabulous Mary Schultz who sent me a similar one. Her card had another layer and she used the Rectangle Framelits for each layer. I went a little more on the simple side but it is just as fabulous! I started with a Crumb Cake card base and layered on a piece of Pacific Point polka dots from the Brights 6″ x 6″ Designer Series Paper Stack. Next, I die cut out the rectangle with the Rectangle Stitched Framelits. 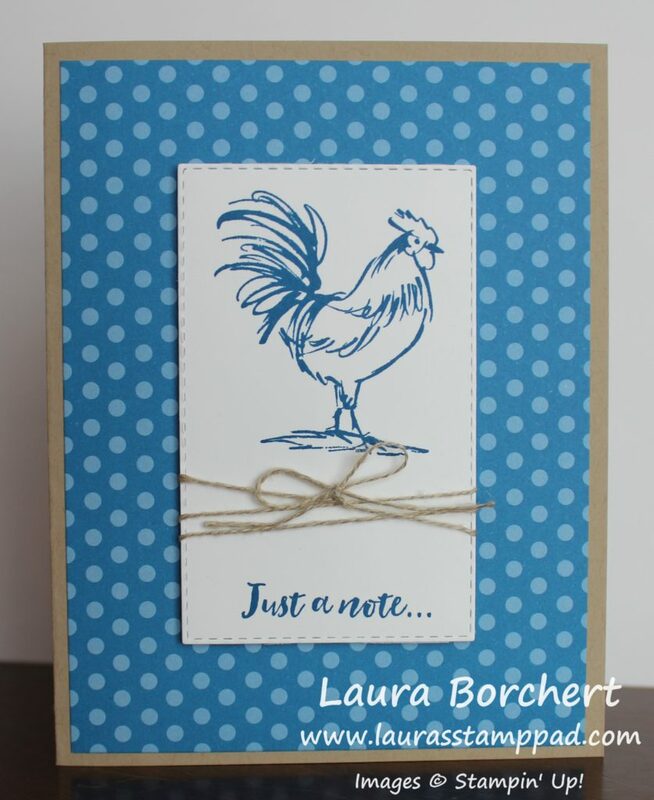 Using the Home To Roost Sale-A-Bration Stamp Set, I stamped the rooster up top and the greeting down low. I went with a monochromatic look and used Pacific Point Ink too! Since the rooster seemed rustic, I tied some Linen Thread around the center and into a bow. This piece was added to the card front with Stampin’ Dimensionals for some texture! 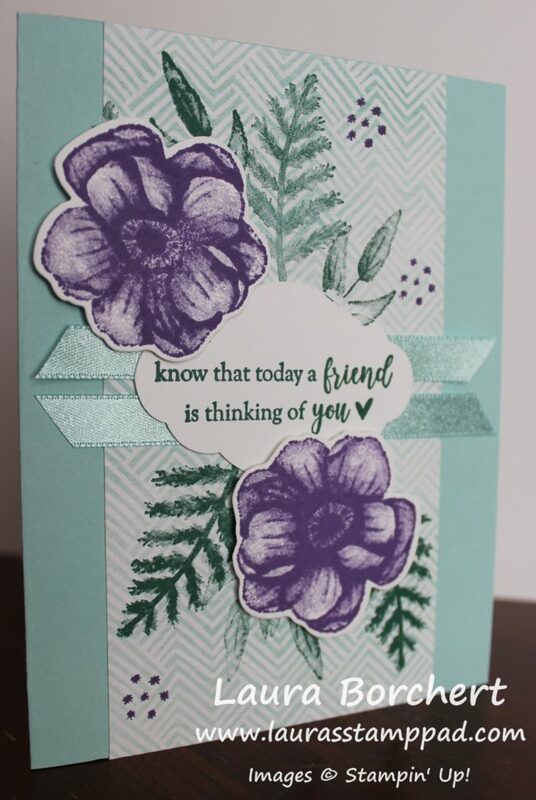 Here is another fabulous one using the Poppy Parade Ink and Designer Paper from that same pack! Which one do you prefer – Poppy Parade or Pacific Point??? Let me know in the comments below! These little frogs from Sale-A-Bration are just adorable. When looking at this card, I thought Flippin’ Frogs because they are all over the place. That reminds me of this crazy “game” at my parents house for the kids to play. The adults hate it because it’s just a tree with rubber frogs all over and then after some time the tree pops and the frogs go flying. There is no real “game” or strategy to it but the kids (grandkids) LOVE IT and pull it out every time. I’ll take this card over that game any day!!! I stamped each of the frogs from the So Hoppy Together Stamp Set and used the coordinating Hop Around Framelits (sold out) to die cut them. You may wonder where that middle front came from….I cut the unicycle off. 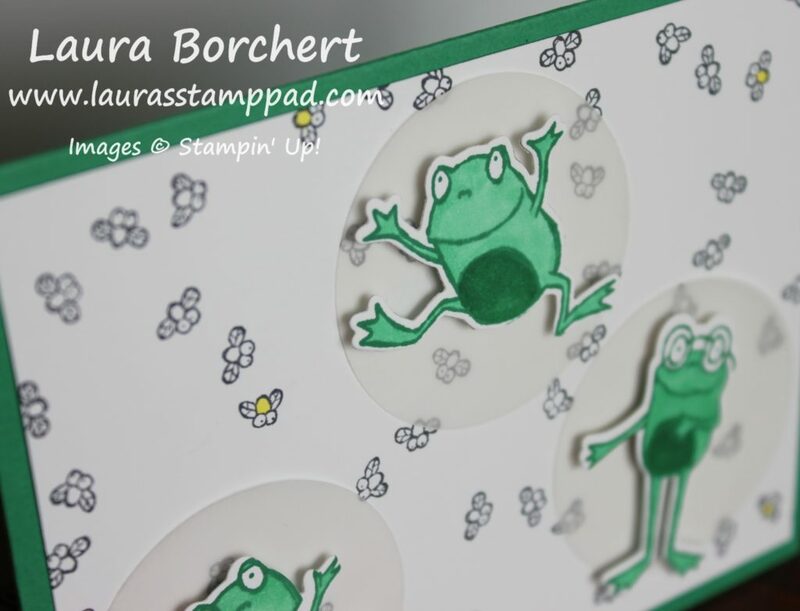 Each frog was stamped in Call Me Clover and colored with the Call Me Clover Stampin’ Blends. To make the frogs stand out a bit more, I added a punched circle of vellum cardstock behind each one. I really love that look….subtle but adds texture and pop! For the inside, I added a piece of Whisper White with a few stamps flies and a frog! I have really been loving to decorate the insides of my cards!!! 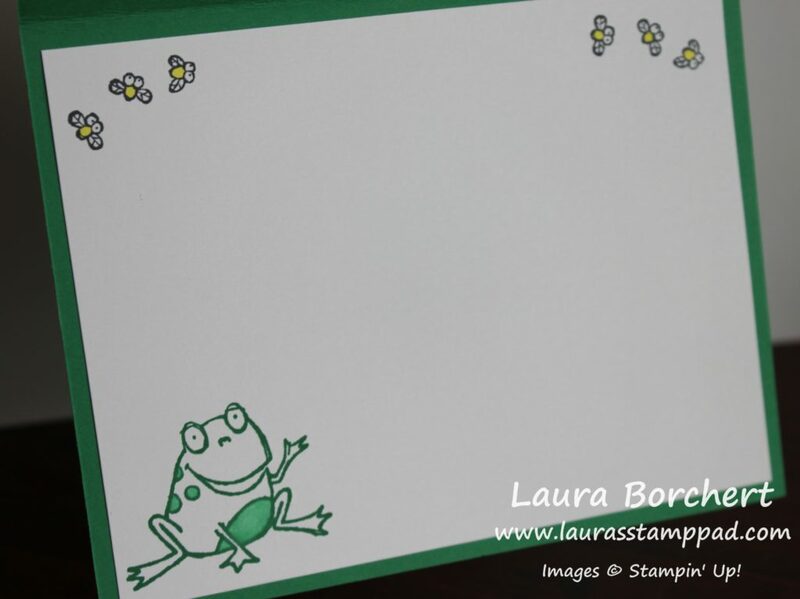 Don’t forget that Sale-A-Bration ends on March 31st so there are only a few days left to get this So Hoppy Together Stamp Set and other freebies for every $50 you spend. Click here to start shopping! Cupcakes are my favorite dessert followed by cheesecake. I love to make cupcakes and decorate them too! I think I have made cheesecake like twice…it is so expensive to make and finicky. So when it’s time for a celebration, we celebrate with cupcakes! What is your favorite dessert to eat, make, or celebrate with?? Let me know in the comments below! Sale-A-Bration ends on March 31st so this is the last week. Get these cupcakes before they are gone! Unfortunately, the coordinating Call Me Cupcake Framelits are sold out already. If you were lucky and got a set, you can recreate this card exactly. If you missed out, You can always fussy cut out the cupcake or just stamp it in the corner! I started with a Granny Apple Green card base and layered on a piece of Lovely Lipstick (4″ x 5-1/4″). Next, I took a piece of Whisper White (3-3/4″ x 5″ and stamped the little flower in Lovely Lipstick. You can stamp all over as a background or in a upper left to lower right diagonal pattern. 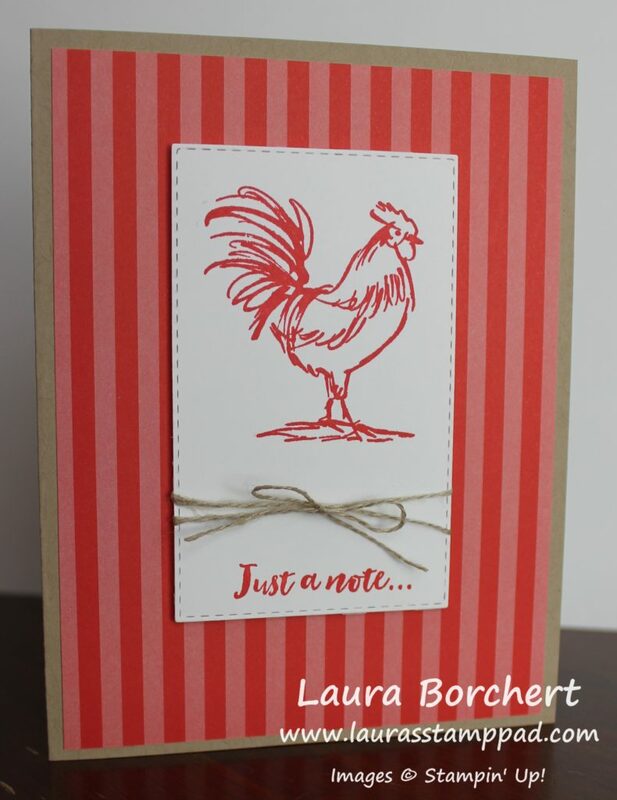 For the greeting, I stamped it in Granny Apple Green Ink and punched it out with the Pretty Label Punch. All of the images on this card come from the Hello Cupcake Sale-A-Bration Stamp Set. 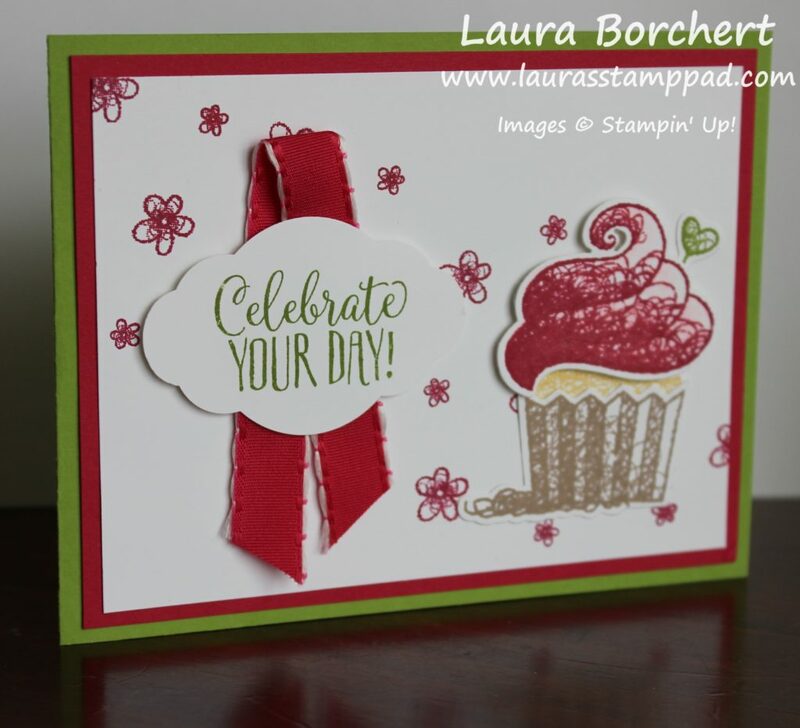 Using a little bit of the Lovely Lipstick Ribbon from the All My Love Ribbon Pack in a loop, I placed it down and added the greeting on top with Stampin’ Dimensionals. For the cupcake, I stamped the liner in Crumb Cake and the cake in So Saffron Ink. I love lemon cake or just a yellow cake. Yellow cake reminds me of my Grandma! 🙂 The icing was stamped in Lovely Lipstick and the little heart was stamped in Granny Apple Green. All 4 of these images were then die cut with the coordinating Call Me Framelits. If you have them, fabulous but if not, no worries. You can just fussy cut the images or stamp these directly to the Whisper White layer (just don’t stamp flowers in that corner). A final little touch that I did was add some Wink of Stella to the icing for a little shine! It did bleed the ink a bit but I was okay with that for a soft pink all around! Still looks tasty to me! Check out the supply list below so you can create this card and earn the Hello Cupcake Stamp Set for Free with Sale-A-Bration (free item with every $50 spent). Using Both Sides of the Paper!!! Happy Tuesday!!! You all know what that means! I have a fabulous technique to share with you today!!! 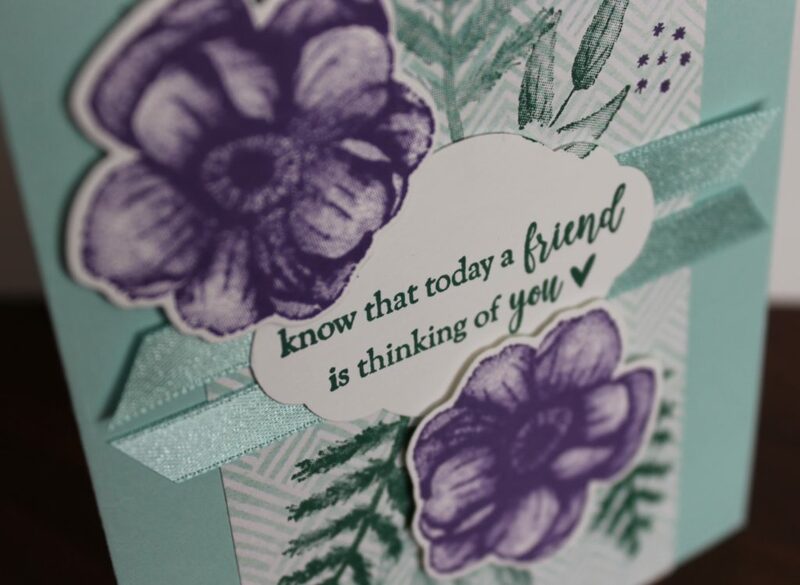 We are using both sides of the paper from the How Sweet It Is Designer Series Paper to create 2 cards! Which one is your favorite – the left or the right?? Let me know in the comments below!! To be honest, I don’t know that I could pick. I really had a lot of fun with this card style……as you can see below with all the different options I just had to try out! I started with a Whisper White card base. Next, I layered on a piece of the How Sweet It Is Designer Series Paper (5-1/2″ x 2-3/4″) and tied some ribbon around the card. I used the Gorgeous Grape Striped Ribbon and the Granny Apple Green/Coastal Cabana Reversible Ribbon. 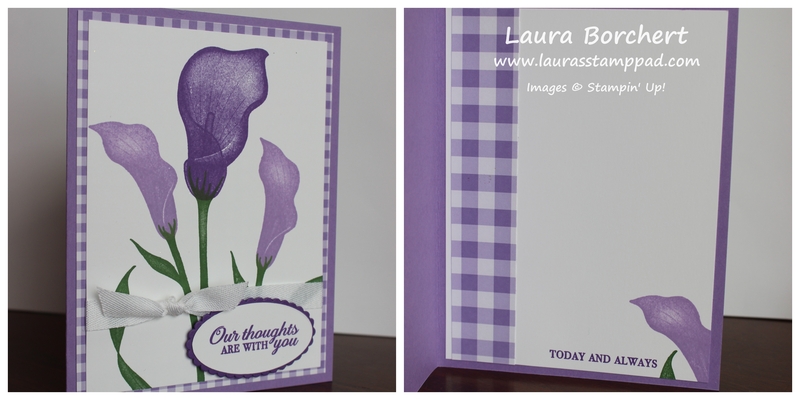 Check out the same below where I even mixed those up and used the reversible ribbon on the purple dotted paper. The paper is the same piece for both cards just the left card using one side and the right card using the other! For the greeting, I stamped it from the Sweetest Thing Stamp Set. I used the same images for the focal point too. 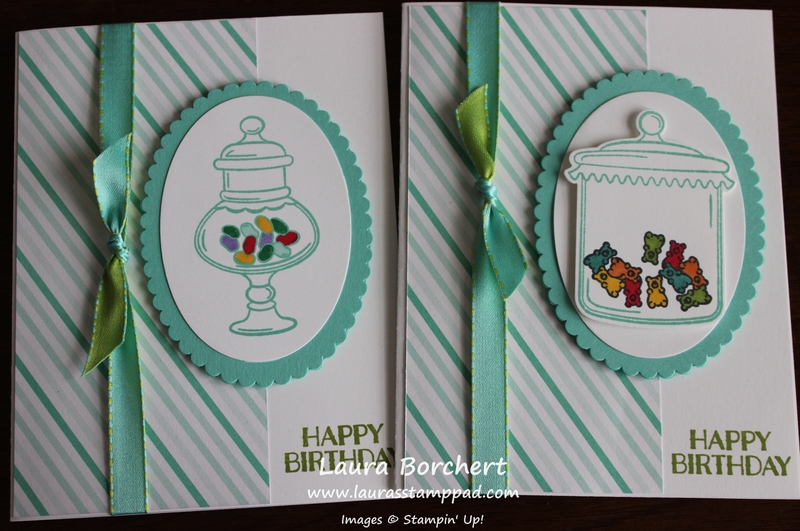 I stamped the candy jar in Coastal Cabana and die cut it with the Layering Ovals Framelits. 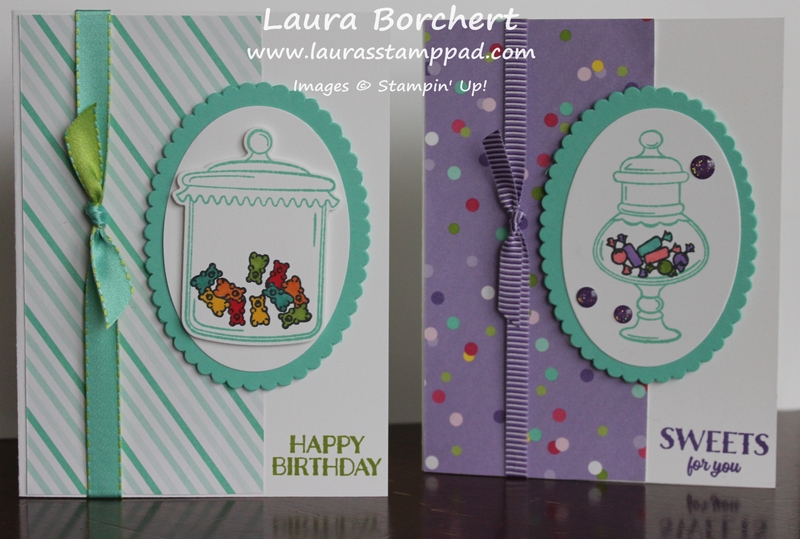 Then I really had fun with the different candy options in the Sweetest Thing Stamp Set. Gum drops, hard candy, jelly beans, gummy bears, and chocolates….YUM!!! 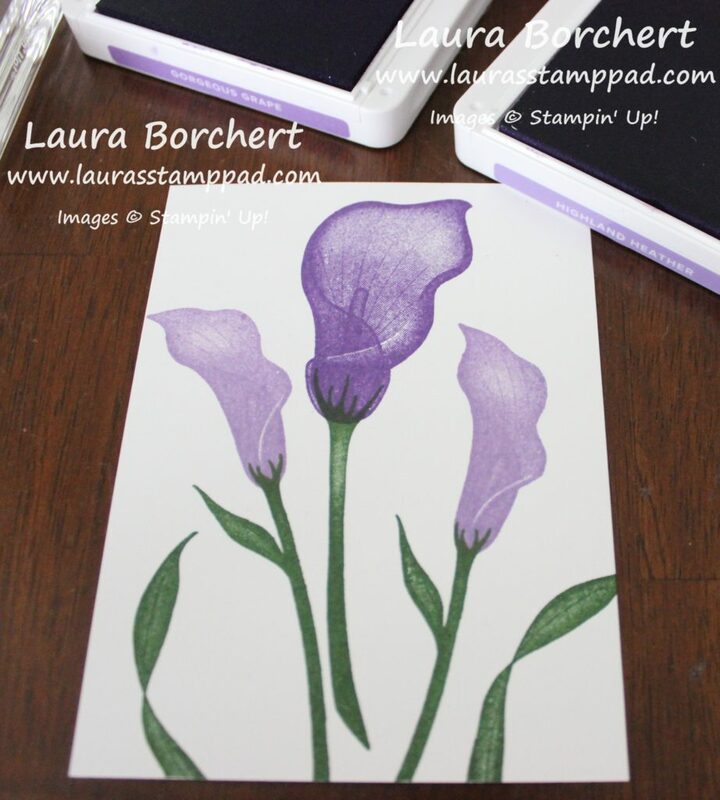 Using Stampin’ Blends, I colored them in! After coloring, I layered the oval onto a scalloped oval of Coastal Cabana and added it to the card front with Stampin’ Dimensionals. I added some Glittered Enamel Shapes to some for a little pop of texture and glitter. So many fun looks and combinations with this amazing bundle. Click the supply list below so you can get started on creating your favorites!!! Which is your favorite??? If you would like to see this all in action, check out the video below or click here! Be sure to give the video a thumbs up if you liked it and don’t forget to subscribe if you are new. If you would like a notification when I post a new video, be sure to click the bell right next to the subscribe!!! Do you like to color? Could you spend hours a day just snuggling on the couch and coloring? I’m with you on the snuggling but I don’t think I could color for hours. I enjoy it in little bits but those adult coloring books give me heart palpitations. The image is just so overwhelming and I don’t know what to color first. If it does that to you as well or you just don’t have a lot of long hours to give to color, check this out – Highlighting With Color!!!! 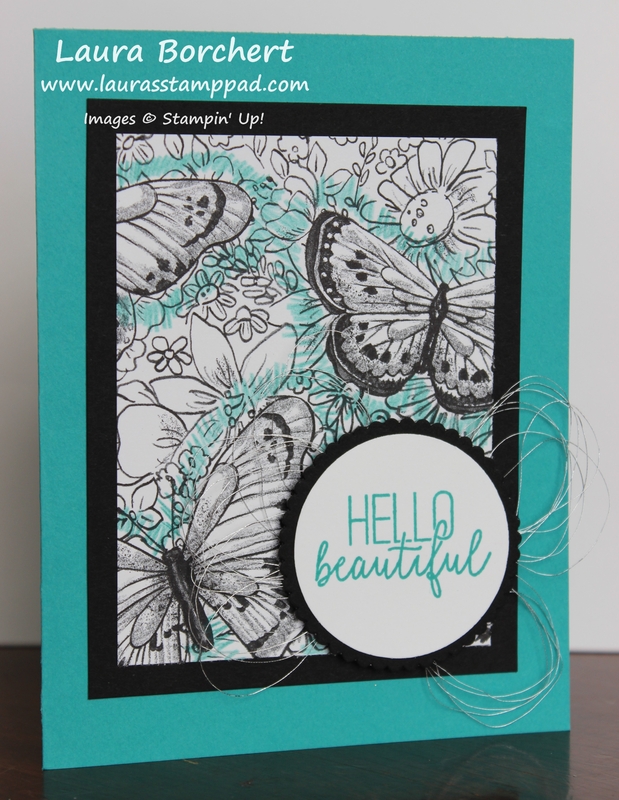 See how those butterflies pop but I didn’t color everything on the Botanical Butterfly Designer Series Paper!!! Just a little bit of color goes a long way and it was quick to do! I started with a Bermuda Bay card base. Next, I layered on a piece of Basic Black measuring 3-1/2″x 4-1/2″. Then I took a piece of the Botanical Butterfly Designer Series Paper (3″ x 4″). Using the Bermuda Bay Watercolor Pencil, I quickly colored back and forth all the way around the big butterflies. Just a simple scratch scratch scratch all the way around! You could always use different colors or all the same color! Once I finished coloring, I layered this piece onto the card front. 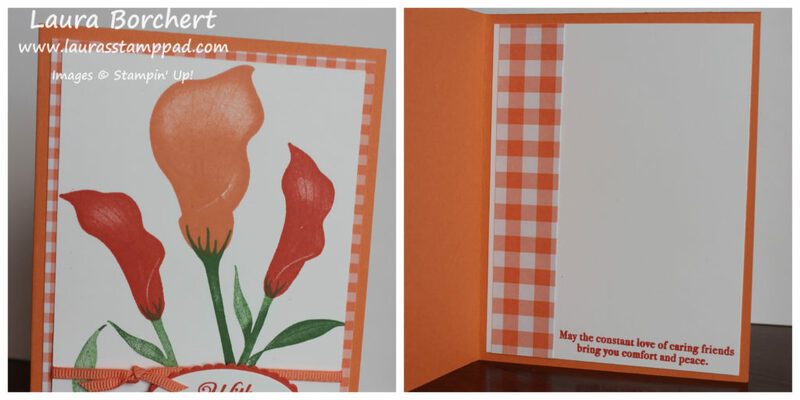 For the greeting, I used the Layering Circle Framelits to die cut a smooth white circle and a scalloped black circle. 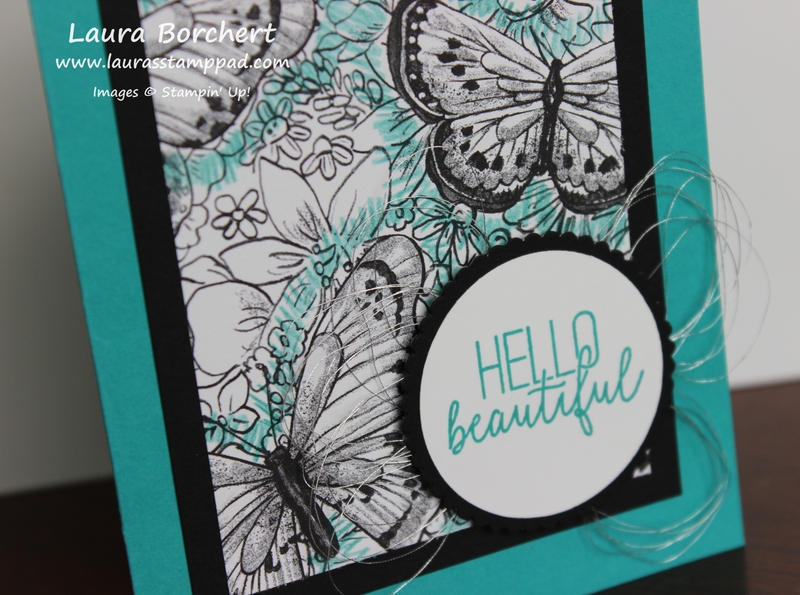 The greeting was stamped in Bermuda Bay Ink from the Butterfly Gala Stamp Set. You can still purchase this stamp set even though the coordinating punch is on backorder! I’ll keep you posted when the punch is available again! For a little bit of texture and shine, I wrapped some Silver Metallic Thread around my fingers to create loops for the back of the greeting. Using Stampin’ Dimensionals, I secured the thread and adhered the greeting to the card front. Depending on where your butterflies are the piece of designer paper that you cut, you can move the greeting around to different spots. I love it! You can earn the Botanical Butterfly Designer Series Paper for FREE with Sale-A-Bration!!! Bring on all things butterflies! I am loving it all this season! I’m also loving monochromatic cards lately. Not sure why, but I have noticed all of my cards have been single colors. Are you a fan or do you prefer a card with all kinds of colors? Let me know in the comments below!